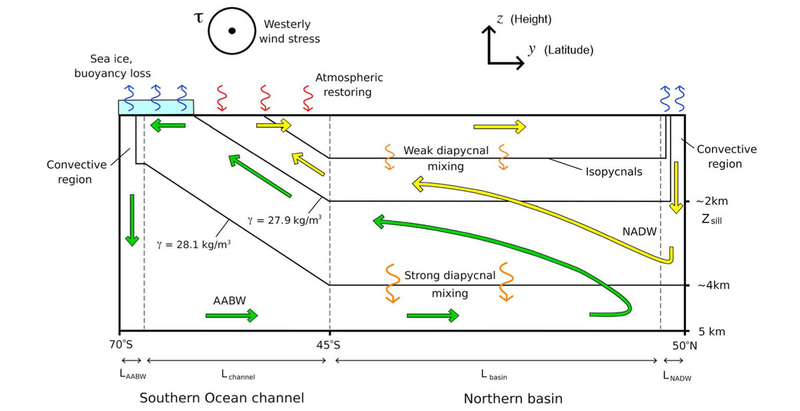 (Left) Schematic of the meridional overturning circulation in depth-latitude space. The green and blue curves are typically viewed as distinct overturning cells associated with North Atlantic Deep Water formation and Antarctic Bottom Water formation, respectively. 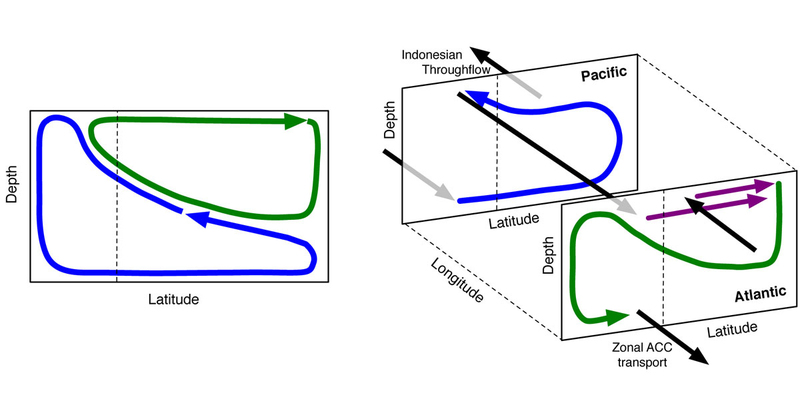 (Right) Idealized three-dimensional schematic of the overturning circulation that cycles through both Atlantic and Pacific basins before closing. Rather than two distinct cells, the overturning more closely approximates a single figure-of-eight loop. Schematics showing the overturning circulation for the modern ocean (top) and at the Last Glacial Maximum (bottom). In the former North Atlantic Deep Water and Antarctic Bottom occupy similar depths, with most upwelling occuring in the Pacific Ocean. 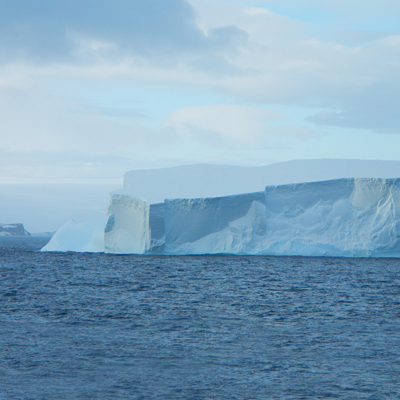 At the LGM, the increase in sea ice extent leads to an increase in the volume of AABW, a shoaling of North Atlantic Deep Water and two distinct overturning cells. Two-dimensional conceptual model of the meridional overturning circulation (MOC), where thick arrows indicate mass transports and thin curvy arrows indicate the direction of buoyancy fluxes. The green arrows correspond to a lower overturning cell associated with Antarctic Bottom Water (AABW), while the yellow arrows correspond to an upper overturning cell associated with North Atlantic Deep Water (NADW). Conceptual models have clarified scientific understanding of the ocean’s deep stratification and meridional overturning circulation (MOC), while making predictions that may be tested via observations and numerical modeling. One example is the one-dimensional advection-diffusion “abyssal recipes” balance, first posited by Munk in 1966. However, we now recognize that the observed diapycnal diffusivity is, in many places, an order of magnitude smaller than Munk’s estimate. This has highlighted the importance of along isopycnal transport in the ocean interior, in particular in the Southern Ocean where deep isopycnals outcrop or are “ventilated” at the ocean surface. Our group's research on this topic has been aimed at building upon existing conceptual models of the global overturning. In particular, we note that the ocean’s overturning circulation inherently has a three-dimensional structure, yet modern quantitative estimates of the overturning typically represent the sub-surface circulation as a two-dimensional, two-cell streamfunction that varies with latitude and depth, which suppresses information about zonal mass and tracer transport. We are working to explore the dynamics of the ocean’s modern “figure-of- eight” circulation that cycles through multiple basins. 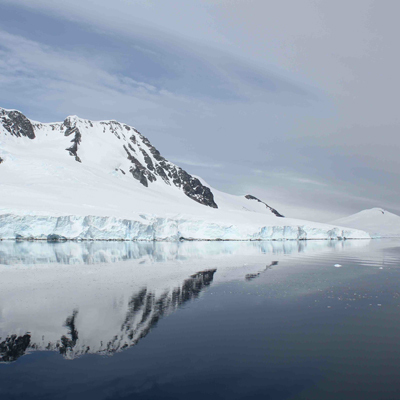 Furthermore, the ocean’s role in regulating atmospheric carbon dioxide on glacial–interglacial timescales remains an unresolved issue in paleoclimatology. 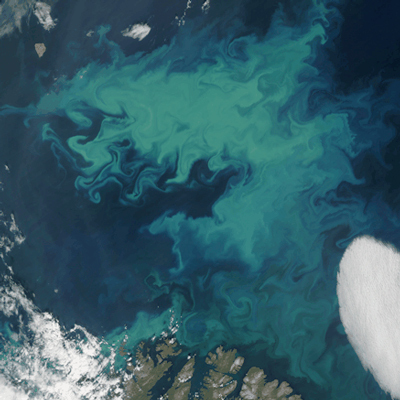 Recent understanding of the deep ocean circulation and stratification is suggests that that the major changes invoked in ocean physics are dynamically linked. 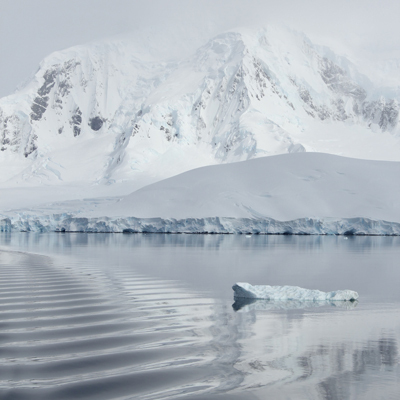 In particular, the expansion of permanent sea ice in the Southern Hemisphere results in a volume increase of Antarctic-origin abyssal waters and a reduction in mixing between abyssal waters of Arctic and Antarctic origin. Thompson, A.F., A.L. Stewart & T. Bischoff, 2015. A multi-basin residual-mean model for the global overturning circulation. /submitted to J. Phys. Oceanogr. Burke, A., A.L. Stewart, J.F. Adkins, R. Ferrari, M.F. Jansen & A.F. Thompson, 2015. 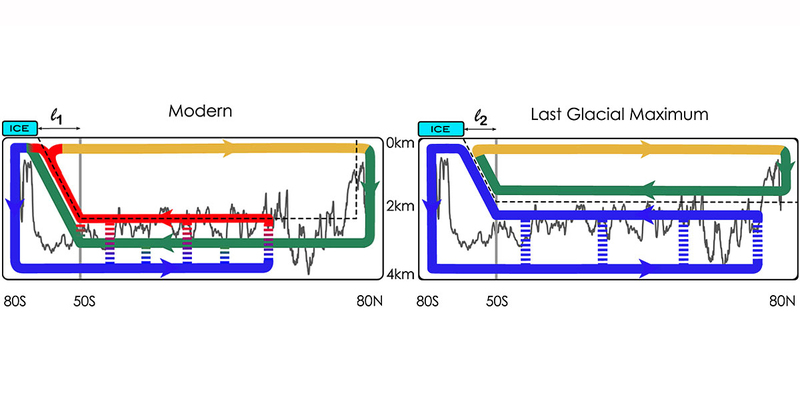 The glacial mid-depth radiocarbon bulge and its implications for the overturning circulation. /Paleoceanography/, 30, 1021-1039. Stewart, A.L. & A.F. Thompson, 2015. The neutral density temporal residual mean overturning ciculation. /Oc. Model./, 90, 44-56.